Since being back in the United States, the one dish from my European travels that I cannot stop thinking about comes from Café Wester in Amsterdam. Like most good things in life we just happened upon this café as we were on a search for some authentic Dutch apple pie. Now I do not want to take anything away from the pie, because it was truly something special – with its light, flaky crust and its slightly tart filling. Bitterballen – A “typical Dutch snack,” but unlike anything I have ever had. Battered in breadcrumbs and fried on the outside, this snack packs a creamy beef mixture that is similar in taste and consistency of cream of mushroom soup. Served with mustard or mayonnaise, this delicious snack is anything but typical! Vlammetjes – These perfect, little packages are made with thin sheets of pastry and chilied beef, which are then deep fried and served with sweet chili sauce. This snack has just the right amount of heat to awaken the taste buds. Cheese sticks – Just when you think cheese sticks couldn’t possibly get any better Café Wester raises the ante by taking local Gouda cheese and frying them up in spring roll wrappers. The result is a crispy cheese stick with a gooey, salty center that is best served with a sweet chili dip. Even if fried goodness isn’t your thing (which would make you crazy) the Café Wester is still a cool place worth checking out. Not only does it serve Heineken Extra Cold (chilled to zero degrees), but it has a friendly wait staff and a laidback and funky vibe – making it an ideal place to pass the time. My favorite place in Amsterdam. Good food, good mood, good ambiance. 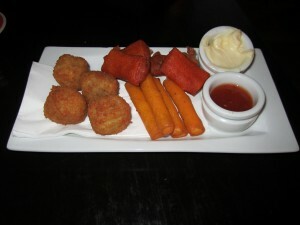 I could go for one of those fried plates and a Heineken right now!